Amid a sharpening financial and economic crisis, global FDI inflows fell from a historic high of $1,979 billion in 2007 to $1,697 billion in 2008, a decline of 14%. The slide continued into 2009, with added momentum: preliminary data for 96 countries suggest that in the first quarter of 2009, inflows fell a further 44% compared with their level in the same period in 2008. A slow recovery is expected in 2010, but should speed up in 2011. The crisis has also changed the investment landscape, with developing and transition economies’ share in global FDI flows surging to 43% in 2008. The decline posted globally in 2008 differed among the three major economic groupings – developed countries, developing countries and the transition economies of South-East Europe and the Commonwealth of Independent States (CIS) – reflecting an initial differential impact of the current crisis. In developed countries, where the financial crisis originated, FDI inflows fell in 2008, whereas in developing countries and the transition economies they continued to increase. This geographical difference appears to have ended by late 2008 or early 2009, as initial data point to a general decline across all economic groups (figure 1). The 29% decline in FDI inflows to developed countries in 2008 was mostly due to cross-border M&A sales that fell by 39% in value after a five-year boom ended in 2007. In Europe, cross-border M&A deals plummeted by 56% and in Japan by 43%. Worldwide mega deals – those with a transaction value of more than $1 billion – have been particularly strongly affected by the crisis. In the first half of 2008 developing countries weathered the global financial crisis better than developed countries, as their financial systems were less closely interlinked with the hard-hit banking systems of the United States and Europe. Their economic growth remained robust, supported by rising commodity prices. Their FDI inflows continued to grow, but at a much slower pace than in previous years, posting a 17% to $621 billion. By region, FDI inflows increased considerably in Africa (27%) and in Latin America and the Caribbean (13%) in 2008, continuing the upward trend of the preceding years for both regions. However, in the second half of the year and into 2009, the global economic downturn caught up with these countries as well, adversely affecting FDI inflows. Inflows to South, East and South-East Asia witnessed a 17% expansion to hit a high of $300 billion in 2008, followed by a significant decline in the first quarter of 2009. A similar pattern prevailed in the transition economies of South-East Europe and the CIS, with inflows rising by 26% to $114 billion in 2008 (a record high), but then plunging by 46% year-onyear in the first quarter of 2009. Dramatic changes in FDI patterns over the past year have caused changes in the overall rankings of the largest host and home countries for FDI flows. While the United States maintained its position as the largest host and home country in 2008, many developing and transition economies emerged as large recipients and investors: they accounted for 43% and 19% of global FDI inflows and outflows, respectively, in 2008. A number of European countries saw their rankings slide in terms of both FDI inflows and outflows. The United Kingdom lost its position as the largest source and recipient country of FDI among European countries. Japan improved its outward position (figure 2). FDI flows increased to structurally weak economies in 2008, including least developed countries (LDCs), landlocked developing countries (LLDCs) and small island developing States (SIDS) by 29%, 54% and 32% respectively. However, due to the distinctive characteristics of these three groups of economies, including their dependence on a narrower range of export commodities that were hard hit by falling demand from developed countries, the current crisis has exposed their vulnerabilities in attracting inward FDI. These economies may therefore, wish to consider promoting FDI in industries which are less prone to cyclical fluctuations, such as agriculture-related industries, particularly food and beverages, as part of a diversification strategy. In late 2008 and the first few months of 2009, significant declines were recorded in all three components of FDI inflows: equity investments, other capital (mainly intra-company loans) and reinvested earnings. Equity investments fell along with crossborder M&As. Lower profits by foreign affiliates drove down reinvested earnings, contributing to the 46% drop in FDI outflows from developed countries in the first quarter of 2009. In some cases, the restructuring of parent companies and their headquarters led to repayments of outstanding loans by foreign affiliates and a reduction in net intra-company capital flows from TNCs to their foreign affiliates. Critically, the proportionate decline in equity investments today is larger than that registered during the previous downturn. Since mid-2008, divestments, including repatriated investments, reverse intra-company loans and repayments of debt to parent firms, have exceeded gross FDI flows in a number of countries. For instance, divestments amounted to $110 billion in the case of FDI outflows from Germany, accounting for 40% of its gross FDI flows in 2008. In the first half of 2009, nearly one third of all cross-border M&A deals involved the disposal of foreign firms to other firms (whether based in a host, home or third country). This depressed FDI flows further. While divestments are not uncommon (affecting between one quarter and four fifths of all FDI projects), they became especially noticeable during a crisis. Indeed the motivations for divestment have been heightened during this crisis as TNCs seek to cut operating costs, shed non-core activities, and in some cases take part in industry-wide restructuring. Greenfield investments (new investments and expansion of existing facilities) were resilient overall in 2008, but have also succumbed to the crisis since late 2008. Available cross-border M&A data by sector indicate that companies in a limited number of industries increased their FDI activities in 2008. Industries exhibiting rising cross-border M&A sales (by value) during the year included food, beverages and tobacco, buoyed by the $52 billion purchase of Anheuser Busch (United States) by Stichting Interbrew (Belgium); precision instruments; mining, quarrying and petroleum; motor vehicles and other transportation equipment; business services; other services; agriculture, hunting, forestry and fisheries; coke, petroleum and nuclear fuel; and public administration and defence. In general, the primary sector witnessed a growth of 17% in the value of M&A sales in 2008; whereas manufacturing and services – which account for the largest proportion of world inward FDI stocks – reported declines of 10% and 54% respectively. The financial and economic crisis had varying impacts on FDI carried out by special funds, such as sovereign wealth funds (SWFs) or private equity funds. Private equity funds were hit especially hard, as the financial crisis struck at their lifeblood: easy capital, which shrank as lenders became more risk conscious. Cross-border M&As by these funds fell to $291 billion in 2008, or by 38%, from a peak of $470 billion in 2007. The main reason for the sharp decline was that the financing of leveraged buyouts – that contributed most to the dynamic growth of cross-border M&As by these funds in previous years – nearly dried up in the second half of 2008.
in commodities prices, the export earnings of which often provide them with finance. Compared with 2007, the value of their cross-border M&As – the predominant form of FDI by SWFs – was up 16% in 2008, to $20 billion, a small amount in proportion to the size of FDI and other assets under their management. This increase bucked the downward trend in global FDI as a whole. However, during the course of 2008, the sharp economic downturn in developed countries and the worldwide slump in stock prices led to large losses in SWFs’ investments (partly because of a high concentration of investments in financial and business services industries), which depressed the pace of growth of their cross-border M&A deals. Moreover, the large size of SWFs and their perceived non-economic intentions have aroused concerns in a number of countries. To counter this concern, in October 2008 a number of SWFs agreed on a set of Generally Accepted Principles and Practices (GAPP) – the so-called Santiago Principles. Prospects for further increases in cross-border M&As by SWFs have deteriorated dramatically, judging by data on M&As for the first half of 2009. Today, there are some 82,000 TNCs worldwide, with 810,000 foreign affiliates. These companies play a major and growing role in the world economy. For example, exports by foreign affiliates of TNCs are estimated to account for about a third of total world exports of goods and services, and the number of people employed by them worldwide totalled about 77 million in 2008 – more than double the total labour force of Germany. However, their international stature has not insulated them from the worst global recession in a generation. The 4.8% reduction in inward FDI stock worldwide was reflected in the decline in value of gross product, sales and assets, as well as employment of TNCs’ foreign affiliates in 2008, a marked contrast to huge double-digit growth rates in 2006 and 2007 (table 1). UNCTAD’s World Investment Prospects Survey (WIPS) 2009–2011 shows that TNCs’ FDI plans have been affected by the global economic and financial crisis in the short term. In contrast to the previous survey, when only 40% of companies reported being affected by the crisis, in 2009 as many as 85% of TNCs worldwide blamed the global economic downturn for influencing cutbacks in their investment plans; and 79% blamed the financial crisis directly. Both of these aspects, separately and combined, have diminished the propensity and ability of TNCs to engage in FDI. The economic and financial crisis has had a strong impact both industry-wide and at the individual company level. This is reflected in declining profits, increasing divestments and layoffs, and forced restructuring. According to UNCTAD’s preliminary estimates, the rate of internationalization of the largest TNCs slowed down markedly in 2008, while their overall profits fell by 27%. In terms of the sectoral composition of the top 100 list for 2007, the majority of the largest TNCs continued to be in manufacturing. General Electric, Toyota Motor Corporation, and Ford Motor Company were among the biggest manufacturers. TNCs from the services sector, however, have been steadily increasing their share among the top 100. There were 26 companies on the 2008 list, as opposed to 14 in 1993, with Vodafone Group and Electricité de France among the biggest. Primary sector TNCs — such as Royal Dutch/Shell Group, British Petroleum Company, and ExxonMobil Corporation — ranked high in the list, buoyed by swelling foreign assets. As for TNCs from developing countries, 7 featured in the list, among them large diversified companies such as Hutchinson Whampoa and CITIC Group, as well as important electronics manufacturers like LG Corporation and Samsung Electronics. The operations of the 50 largest financial TNCs were more geographically spread in 2008 than ever before; however it is not clear what the ultimate consequences of the hiatus of late 2008 and early 2009 will be. With massive government interventions in banking and financial services, some developed-country governments have become the largest or sole shareholders in several of the biggest financial TNCs. This dramatic change, together with the downfall of some of the largest financial TNCs, will strongly reshape FDI in financial services in the coming years. Global FDI prospects are set to remain gloomy in 2009, with inflows expected to fall below $1.2 trillion. However, recovery of these flows is expected to begin slowly in 2010 to reach up to $1.4 trillion, and will gather momentum in 2011 when the level could approach an estimated $1.8 trillion – almost the same as in 2008. In the short run, with the global recession extending into 2009 and slow growth projected for 2010, as well as the drastic fall of corporate profits, FDI is expected to be low. TNCs appear hesitant and bearish about expanding their international operations. This is confirmed by the results of WIPS: a majority (58%) of large TNCs reported their intentions to reduce their FDI expenditures in 2009 from their 2008 levels, with nearly one third of them (more than 30%) even anticipating a large decrease. Considering the 44% fall in actual FDI inflows worldwide in the first quarter of 2009, compared to the same period last year, 2009 could end with much lower flows than in 2008. The medium-term prospects for FDI are more optimistic. TNCs responding to WIPS expect a gradual recovery in their FDI expenditures in 2010, gaining momentum in 2011; half of them even foresee their FDI in 2011 exceeding the 2008 level. The United States, along with China, India, Brazil and the Russian Federation (the so-called BRIC countries) are likely to lead the future FDI recovery, as indicated by the responses of large TNCs to WIPS. Industries that are less sensitive to business cycles and operate in markets with stable demand (such as agribusiness and many services), and those with longer term growth prospects (such as pharmaceuticals) are likely to be the engine for the next FDI boom. Furthermore, in the immediate aftermath of the crisis, when the global economy is on its way to recovery, the exit of public/ government funds from ailing industries will possibly trigger a new wave of cross-border M&As. In 2008 and the first half of 2009, despite concerns about a possible rise in investment protectionism, the general trend in FDI policies remained one of greater openness, including lowering barriers to FDI and lowering corporate income taxes. 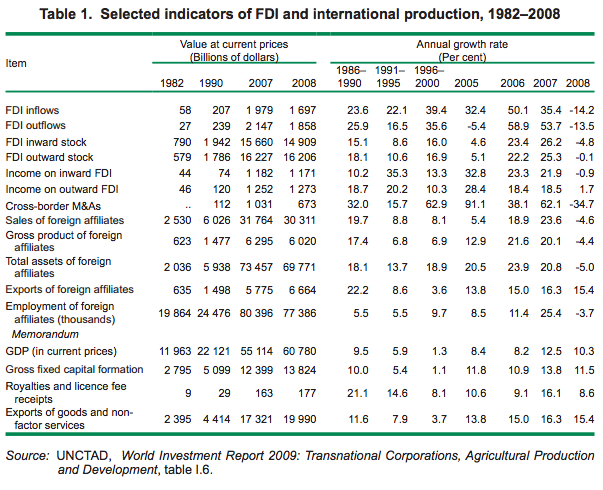 UNCTAD’s annual Survey of Changes to National Laws and Regulations related to FDI indicates that during 2008, 110 new FDI-related measures were introduced, of which 85 were more favourable to FDI (table 2). Compared to 2007, the percentage of less favourable measures for FDI remained unchanged. The trend of scrutinizing foreign investments for national security reasons continued. Regulations to this end were adopted in some OECD countries. They expanded the scope of compulsory notification rules or enabled governments to block acquisitions of stakes in domestic companies. There was also a continuing trend towards nationalization of foreign-owned entities in extractive industries, particularly in parts of Latin America. The most recent survey of investment policy developments in the 42 countries of the G-20 conducted by the UNCTAD secretariat shows that the overwhelming majority of policy measures specific and/or related to investment, taken by these countries in the period November 2008 to June 2009 were non-restrictive towards foreign inward and domestic outward investment. In fact, a substantial number of the policy changes surveyed were in the direction of facilitating investment, including outward investment. There were, however, also a few policy measures that restrict private (including foreign) investment in certain highly sensitive sectors, or introduce new criteria and tests for investments that cause national security concerns. During 2008, the network of international investment agreements (IIAs) continued to expand: 59 new bilateral investment treaties (BITs) were concluded, bringing the total number to 2,676. Also, the number of double taxation treaties (DTT) increased by 75 to a cumulative total of 2,805, and the number of other international agreements with investment provisions (mostly free trade agreements containing binding obligations on the contracting parties with regard to investment liberalization and protection) reached 273 by the end of 2008. In contrast, until the end of 2008, six BITs were terminated. In parallel with the expansion of the IIA universe, the number of investor-State disputes has also continued to increase, totalling 317 at the end of 2008. So far, the current financial and economic crisis has had no major impact on FDI policies per se, since FDI is not the cause of this crisis. However, some national policy measures of a more general scope (national bailout programmes, economic stimulus packages) introduced in response to the crisis are likely to have an impact on FDI flows and TNC operations in an indirect manner. They may have a positive effect on inward FDI, as they could help stabilize, if not improve, the key economic determinants of FDI. On the other hand, concerns have been expressed that country policy measures could result in investment protectionism by favouring domestic over foreign investors, or by introducing obstacles to outward investment in order to keep capital at home. There are also signs that some countries have begun to discriminate against foreign investors and/or their products in a “hidden” way using gaps in international regulations. Examples of “covert” protectionism include favouring products with high “domestic” content in government procurement (particularly huge public infrastructure projects), de facto preventing banks from lending for foreign operations, invoking “national security” exceptions that stretch the definition of national security, or moving protectionist barriers to subnational levels that are outside the scope of the application of international obligations (e.g. in matters of procurement). Looking to the future, a crucial question is which FDI policies host countries will apply once the global economy begins to recover. The expected exit of public funds from flagship industries is likely to provide a boost to private investment, including FDI. This could possibly trigger a new wave of economic nationalism to protect “national champions” from foreign takeovers. IIAs have a role to play in ensuring predictability, stability and transparency of national investment regimes. Policymakers should also consider strengthening the investment promotion dimension of IIAs through effective and operational provisions. Investment insurance and other home-country measures that encourage outward investment are cases in point where continued international cooperation can be useful. All of these developments, as well as impacts of the crisis on FDI flows and TNC activities, have had different effects on the pattern of FDI by region (table 3). FDI inflows into Africa rose to $88 billion in 2008 – another record level, despite the global financial and economic crisis. This increased the FDI stock in the region to $511 billion. Cross-border M&As, the value of which more than doubled in 2008, contributed to a large part of the increased inflows, in spite of global liquidity constraints. The booming global commodities market the previous year was a major factor in attracting FDI to the region. The main FDI recipients included many natural-resource producers that have been attracting large shares of the region’s inflows in the past few years, but also some additional commodity-rich countries. 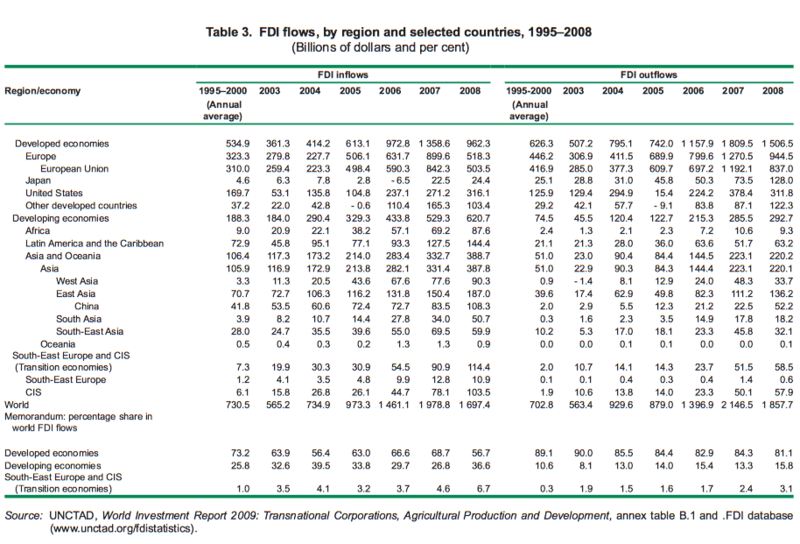 In 2008, FDI inflows increased in all subregions of Africa, except North Africa. While Southern Africa attracted almost one third of the inflows, West African countries recorded the largest percentage increase (63%). Developed countries were the leading sources of FDI in Africa, although their share in the region’s FDI stock has fallen over time. A number of African countries adopted policy measures to make the business environment in the region more conducive to FDI, although the region’s overall investment climate still offers a mixed picture. For example, some African governments established free economic zones and new investment codes to attract FDI, and privatized utilities. However, some countries also adopted less favourable regulations, such as tax increases. At the bilateral level, African countries have continued to adopt investment-related measures. In 2008, 12 countries signed 13 BITs, and 6 signed 9 DTTs, raising the total number to 718 and 467 respectively. As in the past, most of the BITs (8) and DTTs (4) concluded in 2008 were with developed countries. At the subregional and regional levels, the Economic Community of West African States (ECOWAS) adopted three acts relating to investment rules and the modalities for their implementation, and the Southern African Customs Union (SACU) and the East African Community (EAC) concluded agreements with the United States. In 2009, there is likely to be a decline in FDI inflows into Africa following six years of uninterrupted growth. The main reasons for this are the slowdown in the global economy, lower global commodity prices and a worsening of the financial crisis in many developed and fast-growing developing economies. However, the optimistic prospects for global commodity prices might have a positive effect on inflows in the medium term. This prognosis is supported by the results of WIPS. South, East and South-East Asia continued to register strong growth in FDI inflows in 2008 (17%), reaching a new high of $300 billion. But available data in early 2009 point to a significant downturn, and cast doubts about FDI prospects in the short term. At the subregional level, year-on-year FDI growth varied: 49% in South Asia, 24% in East Asia, and -14% in South-East Asia, with inflows amounting to $51 billion, $187 billion and $60 billion respectively. Inflows into the major economies in the region varied significantly as well: they surged in China, India and the Republic of Korea; continued to grow in Hong Kong (China); dropped slightly in Malaysia and Thailand; and fell sharply in Singapore and Taiwan Province of China. China, with inflows reaching a historic high ($108 billion), became the third largest FDI recipient in the world. India, with inflows of $42 billion, ranked the 13th largest FDI recipient. Against the backdrop of the global financial crisis, the ability of these two largest emerging economies to attract FDI has reshaped the landscape of global FDI flows. Inflows to the two are inevitably affected by the crisis, but their medium- to long-term prospects remain promising. This is confirmed by WIPS: respondents to the survey ranked China and India as first and third, respectively, among the most attractive locations for FDI. FDI inflows in services continued to gain momentum in South, East and South-East Asia in 2008. This is reflected in the rising value of cross-border M&A sales in the region’s services sector. This sector accounted for the major share of FDI in some economies, although investments in banking dropped as a result of the global financial crisis. FDI to the services sector in China and India rose, particularly in such services as infrastructure and the retail industries. In India, Wal-Mart (United States) opened its first store in 2008, and plans to open 15 more over the next few years. Outward FDI from South, East and South-East Asia rose by 7%, to $186 billion in 2008, due mainly to large outflows from China. India is becoming an important investor, though FDI outflows remained almost at the same level as in 2007. China gained ground as an important source of FDI: it ranked 13th in the world and 3rd among all developing and transition economies in 2008. FDI from China reached $52 billion in 2008, 132% up from 2007. In early 2009, outflows from the country continued to rise. Indeed, significant exchange-rate fluctuations and falling asset prices abroad as a result of the crisis have created M&A opportunities for Chinese companies. In contrast, FDI outflows from other major economies in the region generally slowed down in early 2009, as the crisis has largely reduced the ability and motivation of many TNCs from these economies to invest abroad. Cross-border M&As undertaken by firms from South, East and South-East Asia in developed countries continued to increase. In the primary sector, in addition to oil companies, large mining and metal companies from China and India have become increasingly aggressive in acquiring overseas assets. For example, in cooperation with Alcoa (United States), Chinalco (China) acquired a 12% stake in Rio Tinto plc (United Kingdom) for $14 billion in 2008. In manufacturing, a recent case was the $2.3 billion acquisition of Jaguar Cars (United Kingdom) by Tata Motors (India). In services, large deals included, for example, investment by Temasek Holdings (Singapore) in Merrill Lynch (United States). Changes in national policies and legislation favourable to FDI took place in some countries, for instance by raising or abolishing FDI ceilings or streamlining approved procedures. This has led to the further opening up of markets in the region and a more enabling business environment for foreign investors. A few other countries introduced new policies and laws to protect sensitive industries. The region concluded 19 BITs and 13 DTTs in 2008, and continued to be the most active developing region with 10 new agreements other than BITS and DTTs signed. Singapore concluded FTAs with the the Gulf Cooperation Council (GCC), China and Peru, while China concluded agreements with New Zealand and Peru. ASEAN countries concluded an FTA with Japan, Australia and New Zealand; and Viet Nam concluded an FTA with Japan. FDI inflows into West Asia increased in 2008 for the sixth consecutive year. They rose by 16%, to reach $90 billion, largely due to a significant growth of inflows to Saudi Arabia (57%, to $38 billion), especially to real estate, petrochemicals and oil refining. This consolidated the country’s position as the region’s leading recipient. FDI growth was uneven among the other countries of the region. For example, it was negative in the second and third recipient countries: Turkey and the United Arab Emirates. In Turkey inflows fell to $18 billion, down by 17%, after the exceptional level reached in 2007, when a number of mega-cross border M&A deals took place in the financial industry. In the United Arab Emirates, they decreased by 3%, to $14 billion, as Dubai’s tourism, real estate and banking industries were particularly badly affected by the global economic and financial crisis. Since the third quarter of 2008, the sharp fall in oil prices and the steadily worsening outlook for the world economy have dampened the optimism that had pervaded the region over the previous six years. Development projects across the region are being hit hard by the tightening global credit markets. The number of international banks willing to lend to projects in GCC countries has shrunk sharply. As a consequence, key oil and gas, industrial and infrastructure projects, which had substantial FDI, have been delayed. This is likely to reduce the level of FDI inflows in 2009. Real estate, petrochemicals, refining, construction and trade were the main drivers of FDI inflows in the two leading recipient countries of the region: Saudi Arabia and Turkey. Together, they attracted 63% of total FDI inflows to the region in 2008. Inflows increased in real estate by 120% to $10.9 billion, in oil refining and petrochemicals by 37% to $12 billion, in construction by 104% to $3.7 billion and in trade by 154% to $2.9 billion. FDI outflows from West Asia declined by 30% in 2008, to $34 billion, largely due to the significant fall (of 45%) in the value of net cross-border M&A purchases by West Asian TNCs. The sharpest decreases occurred in Saudi Arabia (from $13 billion to $1 billion) and in Qatar (from $5.3 billion to $2.4 billion). As a consequence of the large losses suffered from the global crisis, outward investors have become more risk averse, and some have turned their spending to their own crisis-hit economies. On the other hand, the fall in global equity markets has offered new investment opportunities for government-controlled entities. Some, such as SWFs of the Abu Dhabi Emirate, have already begun to make small acquisitions that support their national economic development objectives. 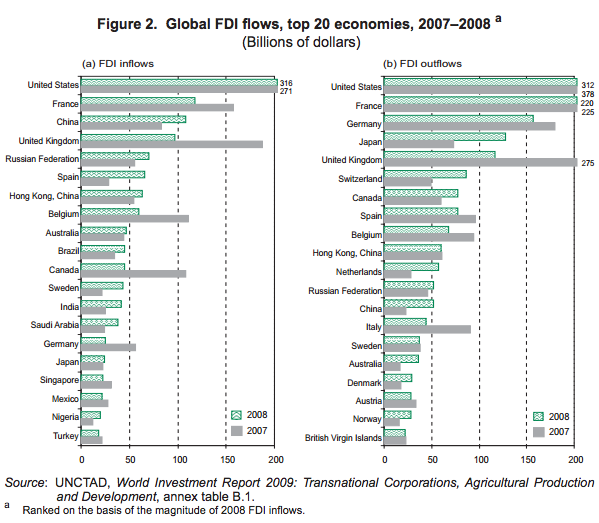 This portends an increase in FDI outflows in 2009. The trend towards a more liberal FDI-related policy continued in 2008 in a number of countries. Examples include reductions in the rate of tax levied on foreign companies, privatization of State-owned enterprises, liberalization of the exchange rate regime, improved access to financing by investors and investment facilitation. The region concluded 15 new BITs, and 12 new DTTs in 2008. Furthermore, FTAs with investment provisions were concluded between Turkey and Chile, as well as between the GCC and Singapore. In Latin America and the Caribbean, FDI inflows increased in 2008 by 13% to $144 billion, despite the global economic and financial crisis. The growth was uneven among the subregions: it was up by 29% in South America – where 49% of the $92 billion worth of inflows targeted Brazil – and down by 6% in Central America and the Caribbean. This divergence was due to the differing impact of the crisis on the economies of the two subregions: Central America and the Caribbean were directly affected by the slowdown of the United States economy, while South America – which relies more on commodity export earnings – was affected later via the drop in commodity prices. Natural-resource-related activities continued to be the main attraction for FDI in South America, and they are increasingly becoming a significant FDI target in Central America and the Caribbean. In particular, FDI in the metal mining industry boomed in 2008: cross-border M&As targeting this industry reached $9 billion in net value – an eightfold increase from the previous year. In contrast, the value of cross-border M&A sales in the oil and gas industry turned negative, indicating divestments by foreign firms as well as nationalizations in this industry. FDI to the manufacturing sector declined due to a sharp drop in flows to Central America and the Caribbean, where foreign-owned export-oriented manufacturing activities are closely tied to the United States economic cycle. In South America, FDI inflows in manufacturing, which are highly concentrated in natural-resource-related activities and more oriented to the internal market and to export destinations other than the United States, were more or less stable. FDI outflows from Latin America and the Caribbean increased in 2008 by 22% to $63 billion, due to soaring outflows from South America (up by 131%), which offset the 22% decline in outflows from Central America and the Caribbean. The strongest increase was registered in Brazil (189%), where outflows reached $20 billion, while outflows from Mexico plummeted to $686 million from the previous $8 billion. The value of net cross-border acquisitions by Mexican firms was negative in 2008 (-$358 million), indicating that sales of existing foreign affiliates of Mexican-based TNCs were higher than the purchases of foreign firms by Mexican-based TNCs. The shift towards a bigger role for the State in the economy continued in a number of countries and extended to new activities. This resulted in more nationalizations in the oil and gas industry. Some countries took measures to strengthen national champions. Latin America and the Caribbean concluded only 6 BITs and 8 DTTs in 2008. The CARIFORUM States concluded the Economic Partnership Agreement with the European Union (EU), thereby agreeing to the progressive, reciprocal and asymmetric liberalization of investment. In Latin America and the Caribbean, FDI inflows and outflows are expected to decline in 2009, as the impacts of the economic and financial crisis spread across the region. FDI inflows to South-East Europe and the CIS increased for the eighth consecutive year, reaching $114 billion – a record level – in spite of financial turmoil and conflicts in certain parts of the region. FDI inflows grew rapidly in both subregions, especially in the first half of 2008. While in South-East Europe most of the FDI inflows were still driven by the privatization of remaining Stateowned assets, in the CIS investment by TNCs was motivated by a desire to gain access to growing local consumer markets and to benefit from business opportunities arising from the liberalization of selected industries. FDI inflows continued to be unevenly distributed, with three countries (the Russian Federation, Kazakhstan and Ukraine, in that order) accounting for 84% of the region’s total. Large investments in the liberalized power-generation industry, as well as in automotives and real estate, contributed to large FDI inflows into the Russian Federation, although the bulk of FDI in the country continued to be in natural-resource-related projects. FDI in oil and natural gas projects in Kazakhstan and large investments in the banking and steel industries in Ukraine drove 2008 flows upwards in both countries. Outward FDI flows in 2008, again dominated by Russian TNCs but also by some investment from Kazakhstan, maintained their upward trend, despite some divestments in the Russian Federation that took place in the second part of 2008. With the slowdown in foreign demand for their products, TNCs from the region shifted their strategies from expanding markets for their products abroad to gaining access to technological innovations and advanced marketing and management know-how. Good market opportunities resulted in an increase in crossborder M&A sales of firms in the region’s manufacturing industries that are not deemed “strategic” (mainly in the automotive and metallurgical industries). Cross-border investment projects in the primary and services sectors marked a pause following exceptionally high values in 2007. However strategic investors continue to invest in the exploitation of vast and complex oil and gas fields. In 2008, countries in South-East Europe and the CIS continued to liberalize their FDI regulations in certain industries such as electricity generation, banking, retail and telecommunications. Conversely, some natural-resource-rich countries introduced certain policy changes less favourable to foreign investors, such as strengthening their control over natural resources through legislation. Countries in the region concluded 25 DTTs and 19 BITs in 2008. The slowdown of economic growth in all the countries of SouthEast Europe and the CIS, and the fall in commodity prices, coupled with the near-exhaustion of major privatization opportunities, is likely to lead to a large decline in FDI in the region. Preliminary data for FDI and cross-border M&As in the first quarter of 2009 and investors’ sentiments – as reflected in the results of UNCTAD’s WIPS – support this forecast. As the economic and financial crisis and the accelerating economic downturn seriously affected all the major economies of the world, FDI flows to and from developed countries fell sharply in 2008, after reaching historic peaks in 2007. Inward FDI flows fell by 29% to $962 billion, and these declines occurred in all major host countries except the United States. FDI flows into the EU-27 countries fell by 40% in 2008, to $503 billion, as the financial crisis and the economic downturn contributed to a decline in inward FDI in the majority of them. In contrast, FDI inflows into the United States, mainly from European investors, rose by 17%, to reach an all-time high of $316 billion. The fall in FDI inflows into developed countries was more pronounced in the manufacturing and services sectors, judging from data on cross-border M&As, while the consolidation process in the mining and quarrying industries and the increasing participation of large companies from developing countries (notably from China) contributed to the rise of FDI in the primary sector in 2008. The decline of reinvested earnings, due to falling profits and the re-channelling of loans from foreign affiliates to the headquarters of TNCs, depressed FDI outflows from developed countries in 2008 by 17%, to $1.5 trillion. However, as in the past, developed countries as a group retained their position as the largest net outward investors. Among the biggest FDI source countries, only Japan, Switzerland, Canada and the Netherlands, in that order, saw a rise in their FDI outflows in 2008, while the United States maintained its position as the largest outward investor. In 2008, FDI policy environments in developed countries were influenced by the continuing public debate about the cross-border investments of SWFs, and fears of new investment protectionism in reaction to the financial and economic crisis. Concerns about possible discriminatory measures vis-à-vis SWFs led to the establishment of the International Working Group of Sovereign Wealth Funds and to agreement on the Santiago Principles. In addition, some developed countries have adopted or amended rules concerning the review of foreign investment on national security grounds, while others have adopted measures aimed at further liberalization of their investment regimes, or have changed tax policies and other incentives to promote foreign investment. In 2008, developed countries concluded 38 BITs (most of them with developing countries), 63 DTTs and 15 other IIAs. FDI to and from developed countries is expected to fall in 2009 because of the continuing effects of the financial crisis and weaker economic growth in these economies. TNCs are expected to reduce their investment programmes because of declining corporate profits, limited access to financial resources and the higher cost of finance. Indeed, FDI inflows in the first quarter of 2009 were 24% lower than in the last quarter of 2008, while cross-border M&As in the first half of 2009 declined by more than 40% compared to their level in the second half of 2008. This is confirmed by WIPS.